Do you have small kitchen and it is quite difficult to keep it tidy and clean than our experts are here with the tips for designing a Small Kitchen. You can use these tips to create the small and efficient kitchen which is small but big on style and efficiency. Designing a small kitchen is not an easy task, it is very challenging job to decorate a small kitchen but one of the first thing we should keep in mind to make sure that there will be enough storage as well as open space to move around when preparing meals. Always choose best furniture arrangement, properly clean sinks and managed cabinets for your kitchen as these arrangement can make your work more easy and your kitchen will look beautiful also. To design a small and efficient kitchen, you have to take care of some areas like Storage facility, Lighting, Appliances and kitchen hygiene. Create an island in the center of the kitchen that can provide storage which is also convenient from any spot in the kitchen but if it is difficult to create a island in the kitchen than use gallery style design which has cabinets lined on either side of the kitchen aisle. You can also hang as many items on the kitchen wall to save the space. Install small racks on the wall or over the stove to get more storage space. Use cabinet that goes from bottom to the ceiling height which will give you a little bit of extra space. Lighting is very essential part of every kitchen. Create illusion in your kitchen with mirrors and lights, use halogen lights or even lighting under your overhead cabinets. You can also use recessed lights in your kitchen ceiling or inside the cabinets. Do not buy the kitchen appliances as they are available on discount or your friend just suggest them, buy them when you really need as unnecessary appliances need more storage which is the main problem of small kitchen. When buying appliances for the kitchen, you might consider some of the more compact and space-saving appliances that are available in the market today. 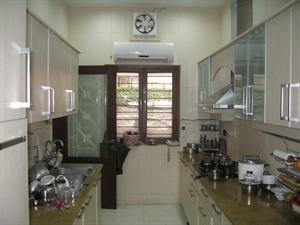 It is very necessary to keep your kitchen clean and hygienic. A sanitary kitchen includes the counter-tops, cutting boards, refrigerator, freezer, pantry, and tools. Sanitation must also be used in dish washing and cooking. Use covered dustbin to dispose the kitchen waste.Use plastic liners in garbage containers and Maintain good drainage system in your kitchen. Kitchen Flooring plays an important role in designing a small kitchen. The kitchen flooring options such as granite,laminates, vinyl, verified tile etc. are commonly available in the market. Always use a flooring which is easy to clean and maintain. If you can't afford a lot of money to install kitchen flooring, then linoleum kitchen floor tiles are the best option. Going to paint your kitchen then we have some simple yet effective kitchen color ideas for you. 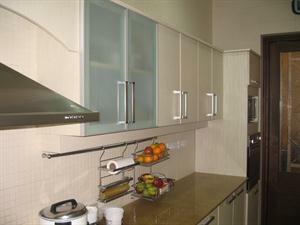 Let us look at the various color schemes which you can apply for the better look of your kitchen. Read about the various Color Schemes for Kitchen, Kitchen Colors, suitable combination for kitchen colors and many more other tips and ideas that will give help you in choosing kitchen colors.